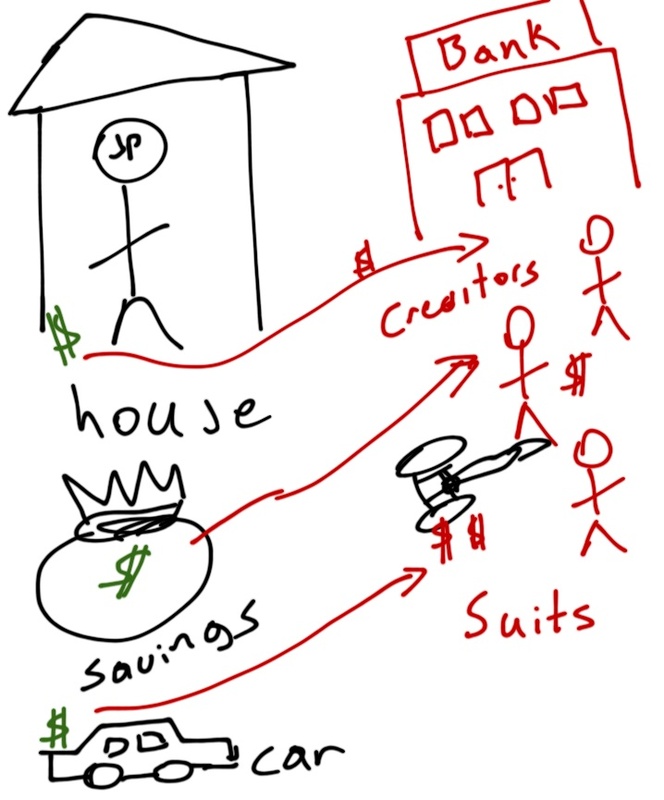 “Draw the Law” is a weekly short post where I try to visualize a legal concept. It is designed to be helpful to the laymen and for a quick understanding. For the next several posts I will be detailing organizing and operating a business. In the prior post in this series we talked about how in a corporation or limited liability company (LLC) a business owner’s identity is separate from the organization. Today we will focus on the other type of ways one could organize a business, namely a sole proprietorship or partnership. Quick, easy, and simple that is a sole proprietorship. One day did you decide to make things and sell them online? You are a sole proprietor. You are the business and the business is you. 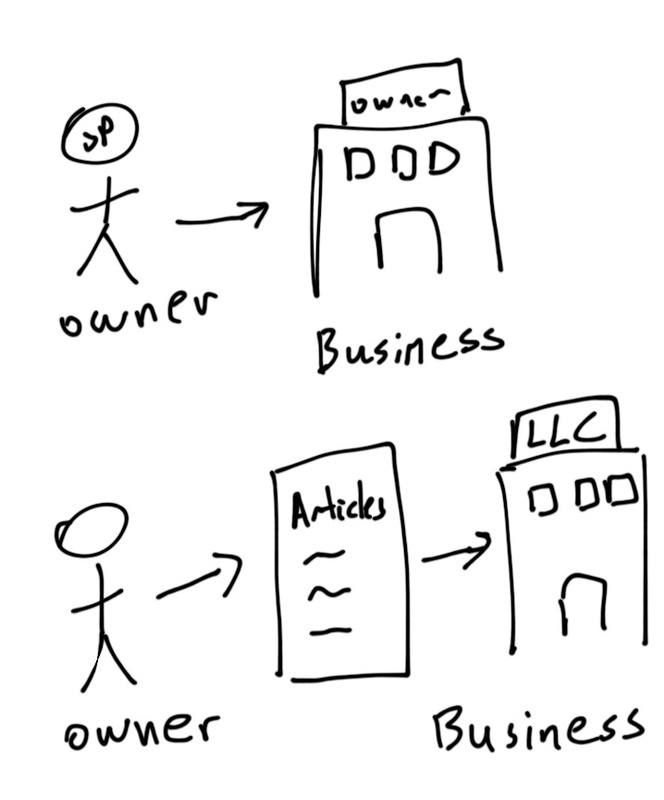 Unlike, the LLC and corporation there is no separate legal entity status, and why? Consider the fact that you did not take steps to formalize such an entity and because of it you need not do any of the formalities associated with corporations and LLCs. One of the basic formalities that you may have to do is register a “Doing Business As Certificate” if you are utilizing a name other than your own to conduct the business. 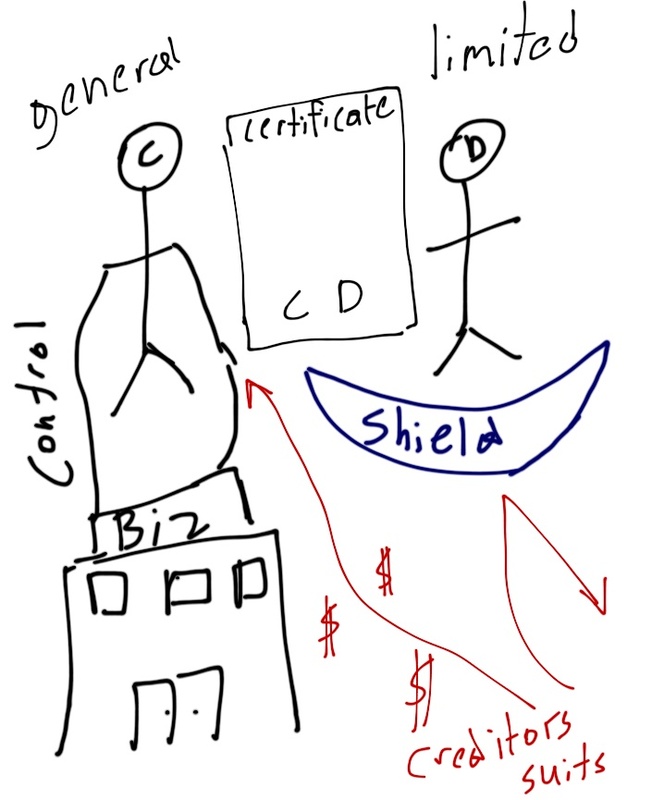 Without the limited liability shield your business assets and obligations are not separate from your personal ones. Your stuff will be used to satisfy debts and other liabilities of your sole proprietorship. Your home, personal savings, car and everything else you own could be used to pay for a court judgment or creditor claims. To highlight how personal assets become entangled with a sole proprietorship consider the situation if you are married. You and your spouse’s stuff that are owned together are all personal assets and therefore, they would be used satisfy debts and claims. It would be hard to say, which things are exclusively yours when you jointly own many things together. 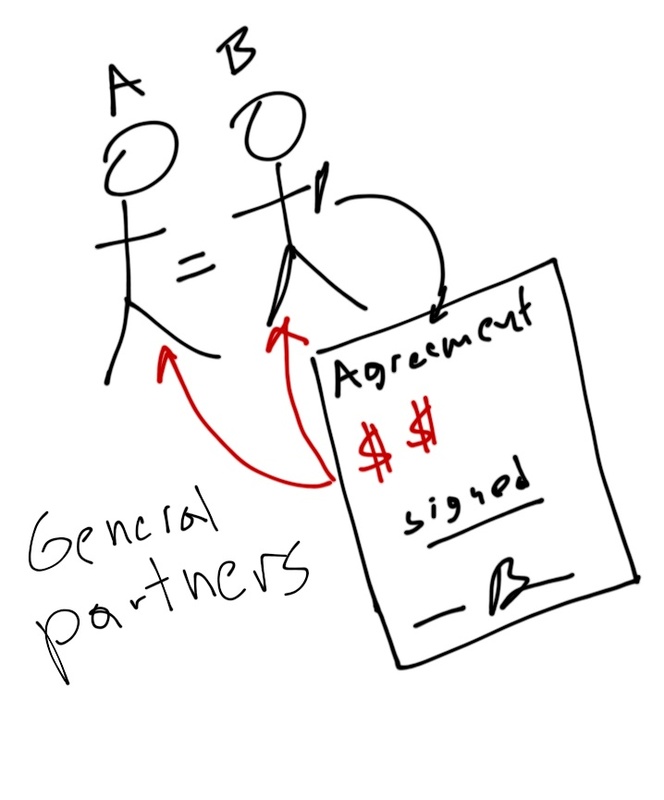 In the case of a general partnership it takes two or more persons, who have not incorporated, and are carrying on a business for profit as co-owners. If all these conditions are met you are in a partnership even if you did not intend or know it. No formal documentation is needed, all you need to is work together with another person, and try to make some money, and you will be considered in a partnership. Similar to the sole proprietor of a proprietorship, each partner in the general partnership has unlimited liability for the debts and obligation of the partnership. However, in the case of the sole proprietor it is just the one person on the hook. In a partnership each general partner’s assets can be used to satisfy a debt or obligation even if that partner disagreed with transaction that led to the debt or obligation. However, there are ways to limit liability. In a limited partnership, there must always be one general partner and one limited partner. The limited partner gets all the benefits of limited liability, but loses out on the ability to manage the business. They cannot actively manage the business. As you might have guessed, this kind of relationship needs to be filed with the state through a certificate of limited partnership. In addition, the partners should have a documented partnership agreement detailing their arrangement, which an attorney can help you with. Now you know all the types of business organizations that exist. They are as follows: sole proprietorship, partnership, corporation, and limited liability company. Next time I will do a quick recap of the four different types, highlight some interesting features, and the time after that we will get into the laws that may affect the operations of a small business.